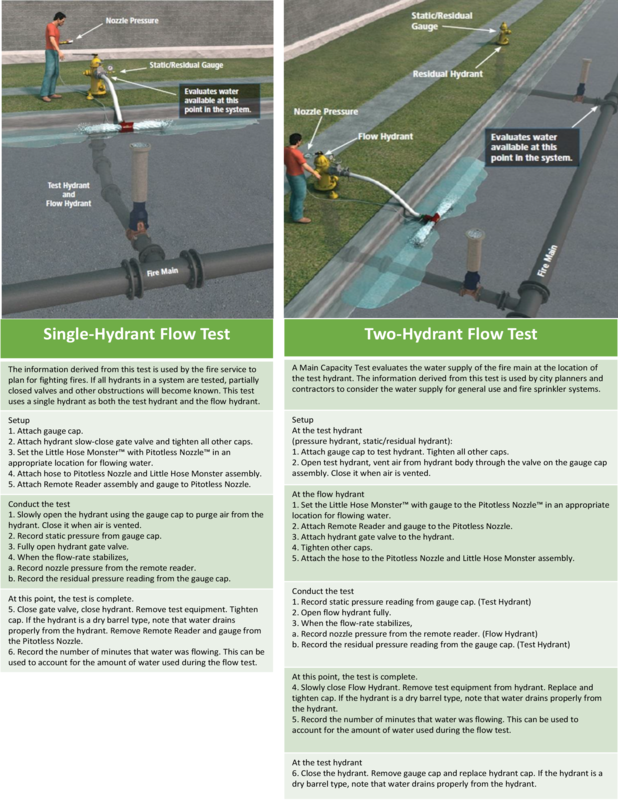 Hydrant flow tests are conducted to determine water availability in planning for firefighting activities, fire sprinkler systems or domestic water demand. The tests are also useful in determining the general condition of the water distribution system by detecting closed valves or wall deposits. A well-maintained water system enables firefighters to extinguish flames and prevent large- scale damage or loss of life. HOW OFTEN DO I TEST A HYDRANT? AWWA recommends flow testing all areas at least every 10 years. (AWWA M17). WHERE DO I FIND MORE INFORMATION ON HYDRANT FLOW TESTING? Hydrant Flow Test Calculator — Calculates the rated capacity at 20 psi for a fire flow test. Our recommended setup for hydrant flow testing includes everything you need for performing a hydrant flow test from the 2.5″ Hydrant port with the Little Hose Monster™. Components fit neatly into a die-cut, closed cell case with wheels and telescoping handle for easy transportation. A 10′ hose is carried outside the case.